Can't even begin to find the words to describe this place. It is in such a perfect location. 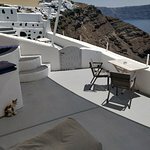 In our whole 6 days in Santorini we didn't see anywhere else we would have rather stayed. Our room was beautiful and so peaceful with the most breathtaking views. Yet we were conveniently close to everything and the centre of Oia. Would 100% recommend this hotel to anyone. Me and my partner would also like to thank Iveta for looking after us and making my birthday so special. She went above and beyond. All the staff were so accommodating and nothing was too much to ask. Perfect stay. Ivetta, the hotel manager, was the most welcoming and accommodating employee! She was available to contact with any questions at all times during our stay. Transportation to and from the airport was included. She arranged our dinner reservations and was a fabulous concierge. 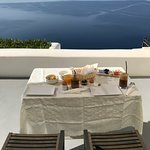 Everything was absolutely perfect starting by a warm welcome, a very careful staff, a tasty breakfast and the most impressive, an outstanding view on caldera. I really recommend it, just take care to go during a sunny season. 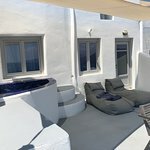 I can not find the right words to describe our dreaming experience in Ambition Suites. Ivetta has planned everything for us. The service is this place is second to none. The location is so unique, out of this planet. 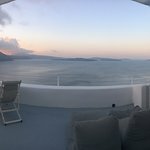 Our Suite overlooked the ocean and caldera bay. 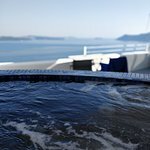 We loved the heated external jacuzzi in our private balcony. The wifi was fast and the bed was really comfortable. 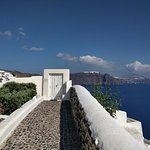 The best point was that although our suite was quiet and it offerred great privacy, at the same time we needed only three minutes walk to be in the bussiest points of Oia Village. 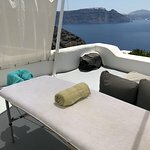 We highly suggest this place and we can not wait to go back in Santorini and Ambition Suites.